Milk constipation can be a problem, especially for children. Milk is a major part of most children’s diets. In my research, I have read numerous accounts of children who experience chronic functional constipation, nausea, cramps and stomach pain, all because of milk constipation. This can cause an otherwise pleasant child to feel cranky and irritable. When these children were taken off of milk, some of them saw their constipation symptoms disappear. Indeed, in a clinical study, 39% of children with chronic constipation started having normal stools when milk was removed from their diet. Other reasons for constipation were a diet low in fiber and not drinking enough fluids. Should we stop drinking milk? Milk contains important nutrients, including much needed calcium. Because of this, many parents are reluctant to totally take their children off of milk. Is soy milk a good alternative? Unfortunately, some children are also intolerant to soy protein, plus soy contains potentially harmful isoflavones, plant compounds that mimic estrogen. Because it's proteins are hard to digest, milk slows down the movement of stool through the colon. Remnants of this stool can gather in pockets of the colon called diverticula, causing inflammation and fissures, leading to pain and constipation. These pockets containing stool can become a breeding ground for infection and even cancer. Sadly, it doesn't take much milk or other dairy products to produce this result. Why is it that children who breastfeed don’t get constipated, while children who drink cow’s milk do? Cow’s milk is the perfect food for calves? Or is it more involved than this? A number of studies have shown that dairy-fermented probiotics like Kefir can actually relieve constipation. One such study was conducted at Emma Children's Hospital/Academic Medical Center in Amsterdam. Twenty 7 year olds were given a daily dose of dairy-fermented Bifidobacterium breve. These children experienced a significant increase in bowel movements and significantly less abdominal pain. My wife and I have been making our own kefir from raw, unpasteurized milk for a number of years. This kefir contains over 30 strains of beneficial probiotics. Our experience is that kefir did help with regularity, plus my wife’s chronic yeast infections disappeared. Yes, probiotics are quite helpful in relieving constipation. Milk is pasteurized to kill any harmful microbes, but in the process pasteurization also kills any probiotics and enzymes that are in the milk. Pasteurized milk causes constipation but dairy-fermented probiotics help to relieve it. When a child nurses, the breast milk is not pasteurized, it is raw. It is known to contain numerous beneficial enzymes and probiotics that help the child digest the milk. Children who drink breast milk generally don’t have a problem with milk constipation. Raw, unpasteurized cow’s milk also contains beneficial enzymes and probiotics that aid in it’s digestion. Beta-lactoglobulin and Casein are large sized proteins in cow’s milk that are difficult for us to digest and are attributed with causing milk constipation. However, it has been found that certain strains of probiotics help the proteins in milk to be digested. I would like to propose that the reason that pasteurized milk can cause milk constipation is because we have killed the very enzymes and probiotics placed in the milk to help digest it. When milk is pasteurized, there are no probiotics left to neutralize milk proteins. Many people are lactose intolerant. Their bodies aren't able to digest lactose, the sugar in milk, resulting in an upset stomach, flatulence, and/or diarrhea, and in some individuals, milk constipation. But is it possible that the enzymes and beneficial bacteria contained in raw milk could take care of this problem for most? My daughter's friend - was she lactose intolerant, or not? A while back my daughter’s friend came to our house to visit for a few days. She said she was extremely lactose intolerant. I suggested to her that the problem wasn't a lactose problem, but an enzyme problem, and encouraged her to try our raw milk. She reluctantly took a small sip, then waited for hours to see the result. But nothing happened. Next she tried drinking a couple of ounces, then waited. Again, no adverse effects. She then drank a full glass of raw milk, and was delighted when nothing bad happened. By the time she left, she was guzzling milk like it was going out of style. I was delighted that she could once again drink milk. I told her that by drinking the raw milk, she had the enzymes and probiotics needed to digest other dairy products. So she ate a piece of cheese, then a big dish of ice cream, with no problems arising. It was true. She wasn't lactose intolerant after all. She was simply enzyme and probiotic deficient. In raw milk, the probiotics and enzymes within the milk continuously feed on sugars in the milk, digesting them for us. Pasteurization kills these probiotics and enzymes, and our body has no way of replacing them. Pasteurized, homogenized milk is a known allergen. The majority of Americans are at least somewhat sensitive to it. The hard to digest Beta-lactoglobulin and Casein proteins contained in milk have been identified as allergens. In researching this topic, I read the stories of numerous people that were allergic to pasteurized milk, but these people found that they were not allergic to raw milk. When we pasteurize milk we kill the probiotics and enzymes needed to digest it. Could it be that our body realizes it can’t digest pasteurized milk, and treats it as an allergen? Maybe the answer isn't to stop drinking milk, but to simply return to a practice thousands of years old, and drink raw milk. In the 1950’s, large confinement dairies didn't use proper sanitation procedures, and sold milk that was contaminated with harmful bacteria. It was dirty milk. To add to this problem, milk trucks weren't refrigerated, which allowed these bacteria to multiply. This resulted in outbreaks of tuberculosis. To combat this, the U.S. Government started requiring that milk be pasteurized to kill any harmful bacteria. However, the problem wasn't that the milk was unpasteurized, it was that the milk was dirty, and wasn't refrigerated during transport. But today, certified Grade A Milk, produced under Government supervision and guaranteed absolutely clean, is available practically all over the country. During a similar period when pasteurized milk had been given, 14 cases were reported. What can we do to stop the calcium in milk from giving us milk constipation? It is common knowledge that calcium causes constipation, and so it is quite possible that calcium rich milk can cause milk constipation. I read accounts of a number of people that became constipated when drinking even raw milk. But when they added a little magnesium to their diet, the milk constipation disappeared. The calcium in milk needs to be balanced out by magnesium. Researchers are now suggesting that our bodies need a 1 to 1 ratio of magnesium to calcium. Most people get way more calcium than magnesium, which can create problems. Magnesium actually has the opposite effect of calcium. Magnesium draws water into the colon, softening stools and speeding up transit time. This is why such products as Milk of Magnesia and Epson Salt are so effective in treating constipation. My wife and I drink a lot of raw milk, but we also take a daily mineral supplement that contains just over 100% of the US RDA of magnesium. Our bowels function almost perfectly. A magnesium supplement is a good idea for most people, since 80% of Americans are magnesium deficient. Magnesium has many health benefits. Some individuals put a bit of maple syrup, honey, molasses or even a pinch of salt into their children’s milk. Some use the milk to make hot chocolate. These all act as a gentle laxatives, to counter constipation problems caused by milk constipation. Allow a glass of raw milk to warm up to room temperature before drinking. Ice cold milk is rough on the digestive system. "Think about it. Our bodies are close to ninety percent composed of bacteria. They are what helps to keep us living. It is almost like they cover us in a kind of armor that helps to prevent things from our environment from hurting us. Bacteria are an important part of our digestive system, helping us to absorb minerals and vitamins. They also help to educate our bodies to prevent harmful microbes from invading. There are bacteria that form lactase, enzymes, living, beneficial bacteria and numerous systems that kill pathogens in organic raw milk. Raw milk can substantially increase the immune system. This is especially notable in those who battle frequent sickness, including children. 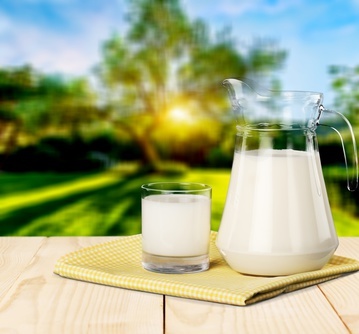 For those who drink pasteurized milk and have symptoms of lactose intolerance, there is a good chance that you won't have those symptoms when drinking raw milk. The reason is that when your body digests raw milk it forms lactase enzymes." "Raw milk heals!! I have been considered “lactose intolerant” for most of my childhood and adult life. Every time I drink pasteurized milk I have severe stomach pains and nausea. When my three daughters were weaned from breastfeeding and began to drink pasteurized milk they would have the same symptoms along with severe constipation that led to many urinary tract infections. A dear friend and Weston A. Price Chapter co-leader gave us a gallon of raw milk to try over a year ago. All I can say is WOW!!!!! What a difference from day one of drinking the raw milk. Instantly, upon the first sip, my daughters and I were hooked. It was delicious and soothing. None of the symptoms we had with pasteurized milk occurred with raw milk! My children beg for raw milk every day and love to go to the farm where we purchase it. My two year old runs to the farmer’s refrigerator and happily squeals, “I wanta my milka now Mommy!” Thank you for protecting raw milk – milk the way it was meant to be!! (LW)"
Can pasteurized, homogenized milk cause milk constipation? Definitely yes. Does raw milk, which naturally contains probiotics and enzymes helpful in digesting the milk, cause milk constipation? Not usually. In cases where it does, balancing out the calcium in milk with magnesium will usually take care of it. Please visit my home page, which has numerous insights on how to overcome constipation.